Many species nest along the river banks making them visible from watercraft traveling along the Amazon and its tributaries. The region is home to the bizarre pre-historic looking hoatzin and the multi-colored sunbittern that emits a low whistle and has bright red long legs. All five species of neotropical kingfisher are found as is the horned screamer, a species as large as a turkey. Large colorful macaws are a common sight in the swamps containing palm trees where they use their strong bill to crack open palm nuts. Macaws gather in large numbers to ingest clay at collpas (clay licks), conveniently located near some of the eco-lodgings used on our Amazon tours. 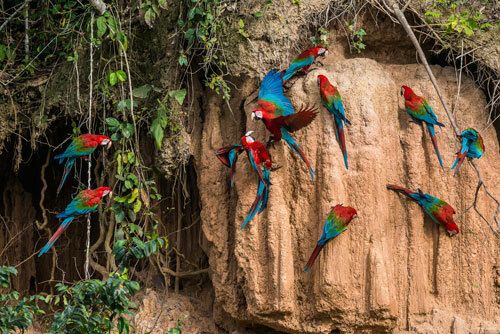 In the Peru Amazon Manu National Park, the collpas attract one of the rarest species of macaw, of the Ara genus. Another swamp species emblematic of the Amazon is the point-tailed palmcreeper with its distinctive song and coloring. Of the ovenbird family, the palmcreeper has cinnamon colored wings and tail with black and white strips on its head and breast. Some birds are more often heard than seen, including the many toucans that inhabit the forest canopy. The harpy eagle, one of the world's most powerful birds with a wing-span of six feet, builds huge nests in the tallest trees of the most remote areas of the rainforest, subsisting on a diet of other tree-dwelling species. Some species live only on the Amazonian river islands, distancing the birds from some jungle predators but hardly a safe haven. The islands form either when a new channel is cut, simply separating the species from the shoreline they previously inhabited or when sediment carried by the river accumulates behind the swirling waters of an eddy. Here new vegetation colonizes, attracting a wide diversity of birds that subsist on these plants. Anytime they travel, visitors on Amazon tours will see birds nesting year-round, though more species nest at the beginning of the rainy season when food is abundant for parents and young alike than during the dry season. Nesting tends to occur when the food that each species depends on is in greatest supply. Since food levels fluctuate according to the flooding in any particular year, breeding seasons in the Amazon rainforest tend to be more unpredictable than in many other places of the world. South America travel offers birdwatchers the opportunity to choose from seven of the continent's top ten birding sites when planning their Amazon tours. These are Peru's Manu National Park; Noel Kempff Mercado National Park in the far eastern Bolivia Amazon; the vicinity of Manaus, Brazil; the Tambopata Reserve in Peru Amazon along the border with Bolivia, the Estacion Biologica Jatun Sacha along the Napo River in eastern Ecuador; around the port city of Iquitos, Peru, and Amacayacu National Park in Colombia.